The best thing is: You can get this new and improved unit for FREE if you've already purchased it simply by going to TeachersPayTeachers and clicking on My Purchases at the top. 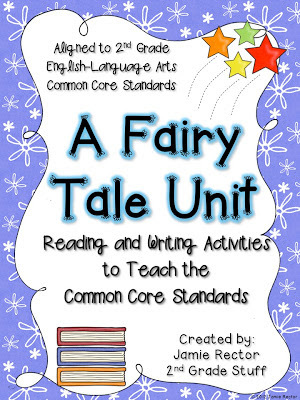 Then find the Fairy Tale Unit and click Download Now! It's FREE as can be and completely updated and refreshed (if you've already purchased it)! So what are you waiting for?! See below for details and if you haven't already purchased it, check out some of the feedback and consider the unit for meeting some of the Common Core Standards in your classroom. I think you'll love it! I just purchased this product this week! I am going to create Fairy Tale Portfolios and we're going to have a Fairy Tale Feast! Your product goes perfectly. Thanks for this resource and your hard work!